Despite recent negative press coverage about the number of apprenticeships dropping in the past twelve months, there has never been a better time to start a scheme. The Government is pushing to create three million apprenticeship places by 2020, resulting in the introduction of the apprenticeship levy and other initiatives for businesses to get on board. Research has shown that apprenticeships bring numerous business benefits, including making it more profitable. The National Apprenticeship Service claims that apprenticeships increase business productivity by £214 per week, and vastly improve staff retention rates; as staff who have started from the ground upwards (with training) are more likely to remain loyal to the business. Other benefits include reduced recruitment costs, improved customer services results and tangible financial returns on investment. So how do you start a scheme, and what are the key things you need to know? What does a scheme involve? According to the National Apprenticeship Scheme, apprenticeships currently exist in around 1,500 occupations in the UK. Apprenticeships vary in length: they must last for at least a year, but many can last as long as five years – depending on the level of the apprenticeship. Apprenticeships usually combine time in the workplace with training and/or study at college, university or other training provider to gain skills, knowledge and qualifications for a job. Apprentices can be new or existing members of staff. 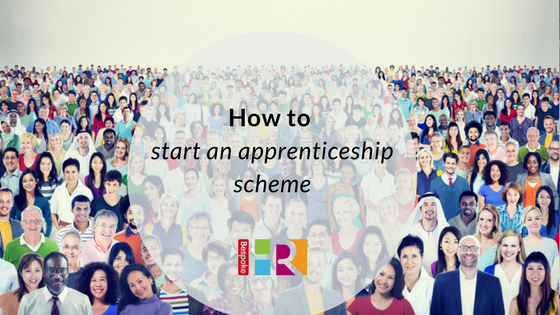 Before you embark on a pilot scheme, you will need to choose the relevant apprenticeship framework or standard and determine the level of apprenticeship that meets your business needs. Once determined, you may then wish to find a registered training provider who can help run your apprenticeship with you. The National Apprenticeship Service has a directory on its website. You must ensure that your business is paying no less than the Apprenticeship Minimum Wage (£3.50 for apprentices age 16 – 18, rising to £3.90 per hour from April 2019), the same applies for apprentices 19 and over and in the first year of their apprenticeship, after that they are entitled to the National Minimum Wage). Another point to note is that all apprentices would normally be expected to work for a minimum of 30 hours per week. Many of the special protections in the regulations for young workers under 18 will apply to some apprentices. It is important to acknowledge that your apprentice may not have had a lot of experience of the working environment. You must give your apprentice a full induction which clearly explains what you expect from them and ensure they know essential information to fulfil their role. Some key policy and procedures to cover include: Health and safety, Equal opportunities and anti-discrimination policies, Employment rights and responsibilities, Confidentiality and data protection policy and your company disciplinary and Complaints procedure as well as information about your company, who’s who, organisation charts etc. Introduced last year to help increase the number of apprenticeships, the levy requires all employers with an annual wage bill of more than £3m to contribute 0.5% of the monthly wage bill to the levy. If you are a levy-paying business, you can use this to fund your apprentice. For those businesses not eligible, the government is offering co-funding 90% of the costs, leaving on 10% for the business to pay. Employers are also not required to pay national insurance contributions for their apprentices if under the age of 25 and on earnings below the higher tax rate. Training can be delivered in a variety of ways depending on the type and level of the apprenticeship. For each apprenticeship there will be standard set of requirements and regular assessment carried out by the training provider. In many cases, apprentices are visited in the workplace on a regular basis by their training provider coach to help them with any questions, provide support or help them adjust to the world of work. For some apprenticeships, all the training and assessment for the apprenticeship may be completed on-site although at least 20% of the apprentices’ time must be spent on off-the-job training. The apprenticeship may need to build a portfolio of evidence of their training and may even be observed in the workplace as part of the assessment process. Other programmes are delivered via a blended approach – giving apprentices time in the classroom alongside other resources and learning-on-the-job to support their development. Higher level apprenticeships are normally provided by colleges and universities and the apprentice given day release to attend their chosen course of study. There is a plethora of help available online at the Government site and numerous specialist apprenticeship training agencies ready and willing to help you source, employ and train an apprentice taking the hassle of trying run an apprenticeship scheme yourself. For advice or information on setting up and running your apprenticeship scheme, get in touch for a chat.